When WOTC announced the reprints of 1e, they highlighted the fact that it would partially help fund the Gygax Memorial. A noble cause, and a welcome one, as for years fans have asked WOTC to make older material available again. And it seems that they heard the fans. 1e was released as a new set of gorgeous books. This was followed shortly by the surprise announcement of a special reprint of the 3e books. Although at this point in time I ask myself who would play this over Pathfinder? I’m not sure who the intended audience is for these particular reprints… but I digress. But it doesn’t stop here. In fact, searching the Amazon site, which unfortunately serves as a spoiler/unofficial press release for WOTC ALL THE TIME, we can see that there are plans to release a whole bunch of other stuff for D&D. Including 2e core books. Putting on the shelves every edition of AD&D ever printed. 1e, 2e, 3e and the current 4e stuff that still sits on shelves. That’s a lot of D&D. There are also adventure hardbacks coming for 1e stuff, along with other 3e books besides the core three. The 2nd edition Core D&D books coming out in May. I sincerely hope we get the yellow versions and not the later black ones. I really prefer the older 2e stuff to the later books. The 3.5 magic Item Compendium and Spell Compendium. Again, I wonder who the target audience is for these books. Pathfinder players? Dungeons of Dread: S Series Adventure Compilation. Okay, this is cool. A hardback collecting the S series of adventures. I wonder if the artwork will be updated… This is great. Against the Slave Lords: A Series Adventure Compilation. Again, I wonder about the artwork. I can’t help to be excited about this. The cool thing about these adventure compilations is how easily they probably translate to D&D Next. They are due for release in 2013, well before the playtest is over, if we believe the assumed 2014 release of Next. So Wizards is listening (or they need to generate tons of cash before Next books are released). Either way, this is what fans of older stuff have been asking for and there it is. Remember that at Gencon they also announced the digital catalog would be coming back. So they definitely have heard the fans. So what’s missing from this? What would I like to see? Well, let me preface this by saying that I have a particular opinion about so many different D&D books sitting on the shelf. I feel that it can be confusing for new people entering the hobby. I have written about that before so I am not going to get into it here…. 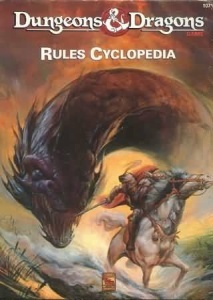 So having said that, and since they are reprinting everything… I’d love to see a new reprint of the Rules Cyclopedia. This is a gorgeous D&D book, released in 1991, which collects all the rules from the Basic D&D Boxes in one hardback. For me, this book alone is a complete game. It has rules for characters up to level 36! It has monsters, it has a setting (Mystara and Hollow World), it has rules for mass combat… It is a whole and complete game in one book. I own it, bought it off ebay for a ridiculous price some time ago. A reprint would be very welcome by the community in my opinion. So here’s my prediction for what’s next… I predict that the next big reprint from WOTC, leading up to both the 40th anniversary of D&D in 2014, and the release of D&D NEXT will be…. a reprint of the original 1974 pamphlets (TSR 2002). I predict an expensive collector’s edition in a wood grain box and everything, as the originals were released almost 40 years ago. I also predict that this will sell like hotcakes. 🙂 Time will tell if I am wrong…. So it seems that the floodgates have opened and WOTC is throwing everything but the kitchen sink on the shelves, both physical and digital. 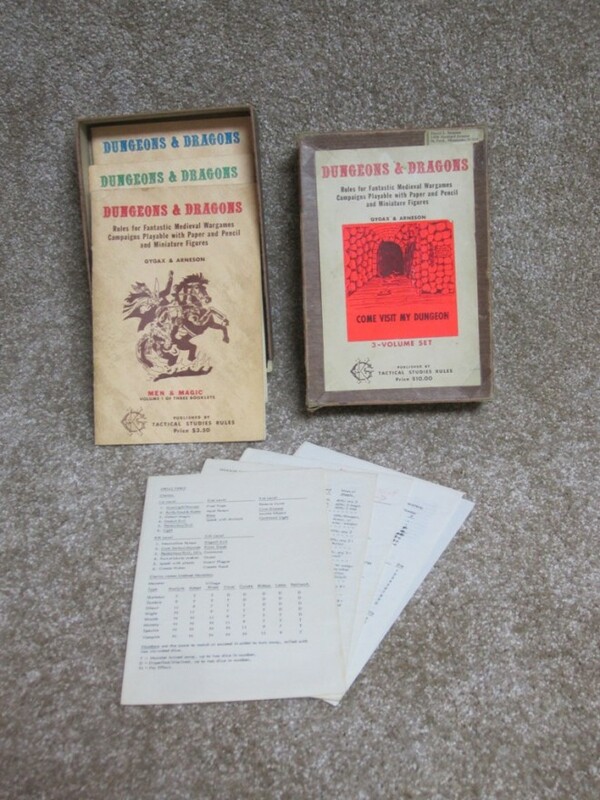 I have my doubts as to how well this serves D&D in the long run (although financially I won’t argue with the cash that it is likely to generate). But what do you all think? Is this good? Why? Is it diluting the brand? What are your thoughts? Discuss! Heh, I wondered the same thing about the 3.5e reprints. Only reason I can think of to go 3.5e over PF is that you already have them. So why buy new ones? I’m in a 3.5e game right now instead of a PF game, simply because we all have gobs of 3.5e books and no PF. I think the Rules Cyclopedia will happen. Unfortunately I doubt the BECMI boxed sets will, at least not in their former glory. Look at say, Gardmore Abbey, not a great box. I think the boxed sets of old are too expensive to make nowadays. And I think putting all of them out will confuse people trying to start up in the interim between editions. Having all the rules in the Rules Cyclopedia will be enough. @robert: I don’t disagree… this was just a wish list, but I doubt that they’ll go that route. The reasons you state are right. The thing is…people who would buy the old boxes would be doing it for nostalgia purposes and may be more willing to spend extra to GET those boxes. I don’t really think WOTC “heard the fans” as you put it. Fans have been asking for this stuff for a long time now and basically ignored. They have capitulated only because they need an income stream in the interim before D&D Next comes out. Yeah, about the 3e books being reprinted….its not like these books have been out of circulation for 20+ years, so it doesn’t make any sense to do so. I bought the reprints of the 1e core books as I lost my originals years ago. I’ll probably get the hardcover adventure compilations. The Rules Cyclopedia seems to be a popular choice. I never owned it, so I don’t really have a feel for it, but it does seem to neatly solve the issue of reprinting BECMI (which I think is a bit much). What comes next depends on the strategy, and that’s where we are really all guessing. It could be as simple as something to sell while the team, which feels a bit small these days, is focused on Next (and DDI, etc.). Offering reprints is great. They bring a bit of new life to older products, possibly creating new audiences in addition to providing grognards with sweet memories (and perhaps a reality check on nostalgia… those older rules had many issues!). Historically, reprints sustain a high collectible value – they tend to do really well over time because they are often produced in high quality and smaller quantity. Beyond that, is there something? What if Wizards was to create a new program to encourage the play of any older edition, and allow under a new revenue sharing program a way for fans of those settings to publish for those editions? I’m not really sure if that is real money, but if they keep it light on their end and as a means to sell their back catalog, it could be worthwhile and strategically keep competition down (giving Wizards a stake in or even controlling any retro movement). But, the focus has to be on Next. Push too hard for “play any edition”, especially in a way that might create another competitor in the style of Paizo, and that could be a massive problem. Next needs to bring people together. To that extent, exposure to these old rules might help gamers realize the good and bad of those older editions and see the benefit of a Next that pulls the best out of those editions… if it manages to do so. I also want to see a better OGL, which has revenue sharing (so Wizards actually gets something for their IP) and entices companies to use it by providing support and an iTunes-style store. We shall see! @Brothershinrin, I don’t believe that to be accurate. There are many difficulties with the idea of just releasing older material. Why would you ever want to take away from your current edition? Wizards is a business, and they should think like one (they don’t do so often enough!). Not releasing the back catalog isn’t because they don’t love us. They do care deeply for us (I’ve seen this every time I speak with them), and they do want to see older material (they want it on their own shelves!). But, it just isn’t such a clear business case. You can end up really taking away from your goals if this isn’t done right. You want people playing your current edition. A big part of that is the plan for how you support (or not) these reprints. If you reprinted edition X and released digital versions and print versions of classic adventures for that edition… are you wanting gamers to switch to that edition? What happens to the products you are selling for Next… did you just compete against yourself? (And, because of publishing costs, that is a very big risk). Strangely enough, according to my FLGS owner, 3.5 stuff is selling fast and for nearly full price. My brother-in-law got a ton back when he sold his 3.5 stuff to the owner just a few months back. second edition is the best the rest is just fast paced gobbledegook. It’s great that there is interest in the reprints but I prefer to own copies of the originals with the unaltered cover art. I’ve acquired much of the BECMI materials, including the excellent Rules Cyclopedia, and have great copies of the core AD&D hardcover books. I’m an old school hold out AD&D 1e/2e player and part-time DM (on extended hiatus). The aim was to make a slightly more flexible and survivable game with restoration of 1e sensibilities. And thumbs up to the Mystara setting and Gazetteers – which we used as an AD&D campaign setting with Greyhewk elements plugged into it ! 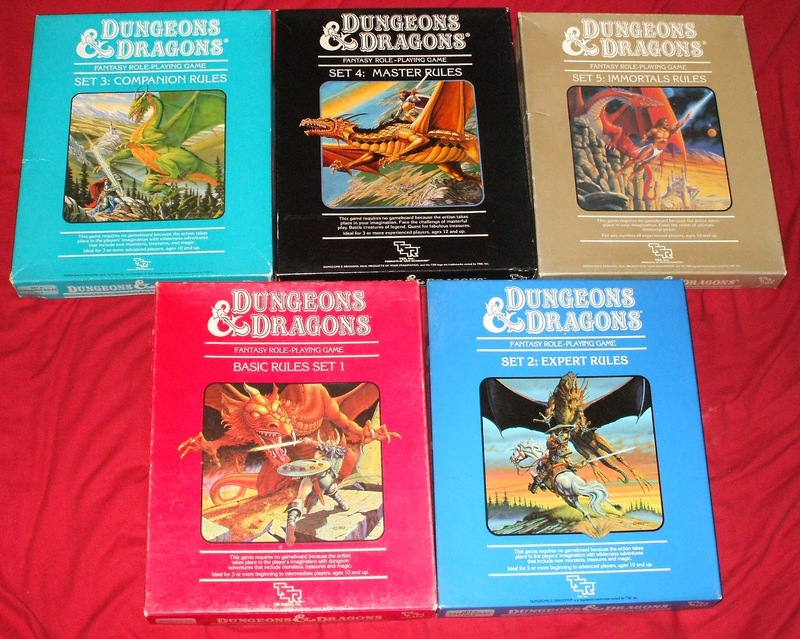 Most of our adventures were either from 1e modules, Dungeon Magazine, and many of our own invention. 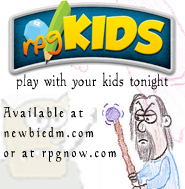 We also played in the Forgotten Realms setting. Very Good times ! whoah this blog is excdellent i reslly liike studying your posts. round for this info, yyou could help them greatly. doo not discuss such subjects. To the next! Best wishes! !